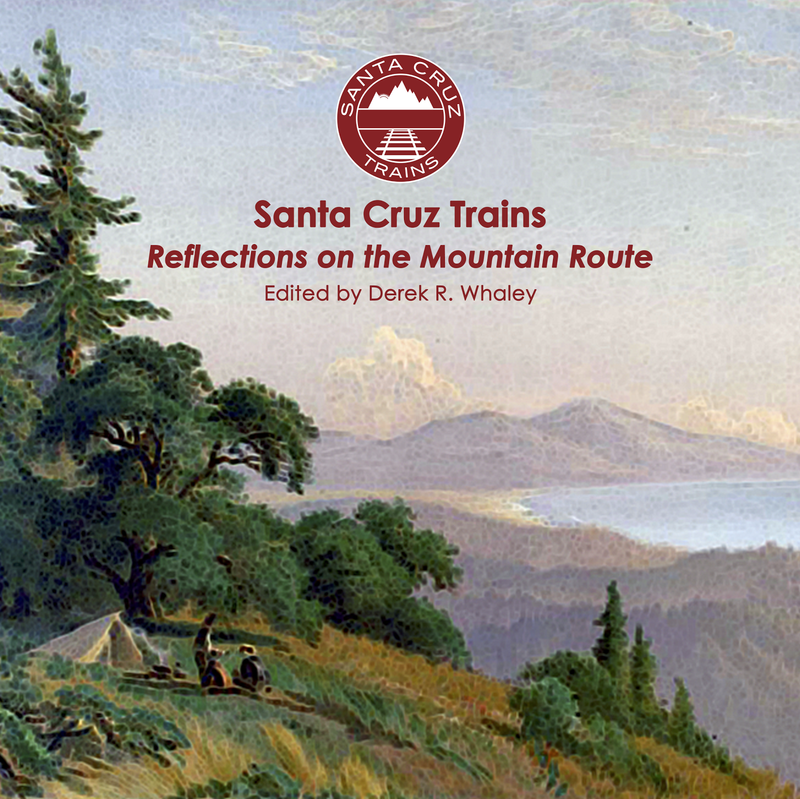 With its beautiful beach and many bathhouses along the shoreline, the South Pacific Coast Railroad established the south end of its Mountain Route not at Santa Cruz Depot but on the Santa Cruz Main Beach as early as 1880, as depicted in the 1880 SPC Timetable (link above). Activity had been busy on that beach since 1866 when Elizabeth Liddell built her first bathhouse on the beach prompting Santa Cruz's age of tourism. Hoping to profit from tourist travel, the South Pacific Coast ran trains to its terminus at the beach when the line first opened to Los Gatos. 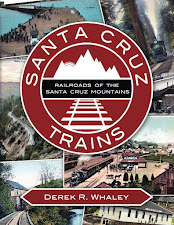 The route itself continued over the San Lorenzo River to Seabright Beach and Capitola via the Santa Cruz Railroad, operated by the Southern Pacific Railroad from 1881 and onwards. 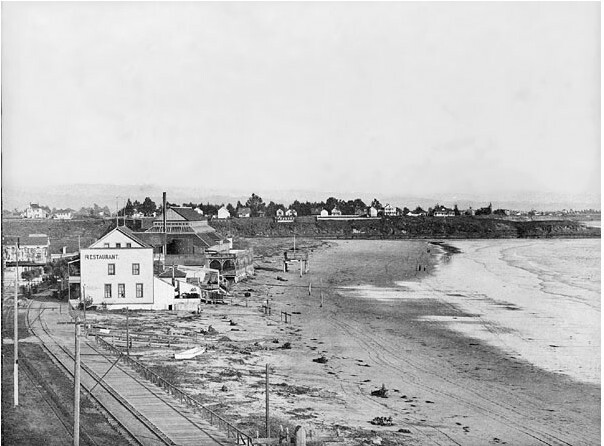 The Main Beach in the 1870s when there were only streetcars. 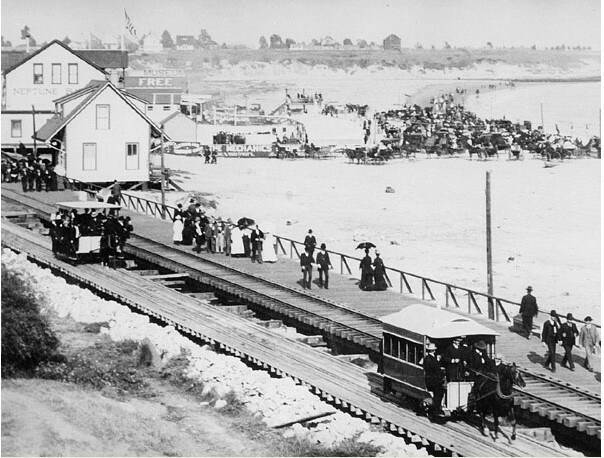 The streetcar track (with two horse-drawn cars) is beside the narrow gauge South Pacific Coast track, c. 1880. Streetcars delivered tourists to the beach in droves beginning in 1875 with a line built parallel to the Santa Cruz & Felton Railroad extension being built toward Watsonville. This line would soon be leased then purchased by the South Pacific Coast for its own use. The streetcars survived until 1926. 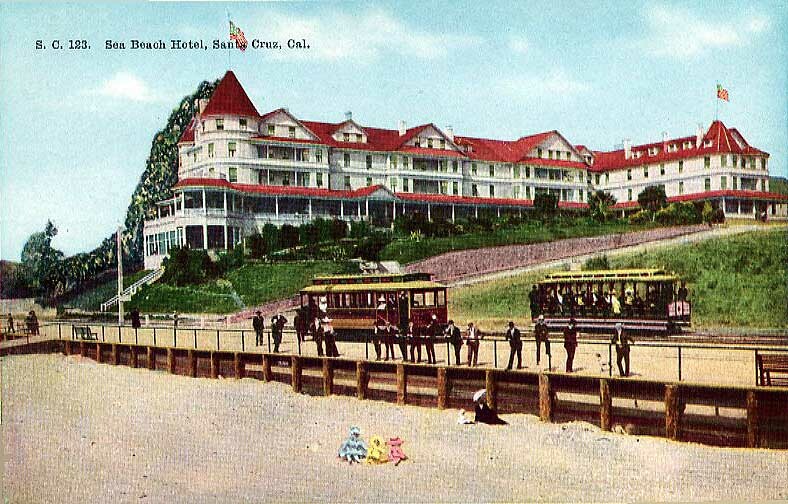 The Sea Beach Hotel with President Roosevelt lounging beneath a parasol and his children playing on the sand. Two streetcars passed behind with Secret Service agents hanging off the railing above. 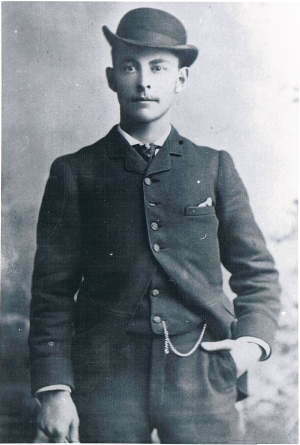 In 1903, a local entrepreneur by the name of Fred Swanton set about building a grand palace on the beach. Part of his plan involved enlisting the Southern Pacific Railroad in his marketing campaign to bring tourists to Santa Cruz. For two years he travelled across the country advertising Santa Cruz before the casino was even built. In 1903, he even convinced President Theodore Roosevelt to visit in what may have been one of the first times the train officially stopped at the beach. 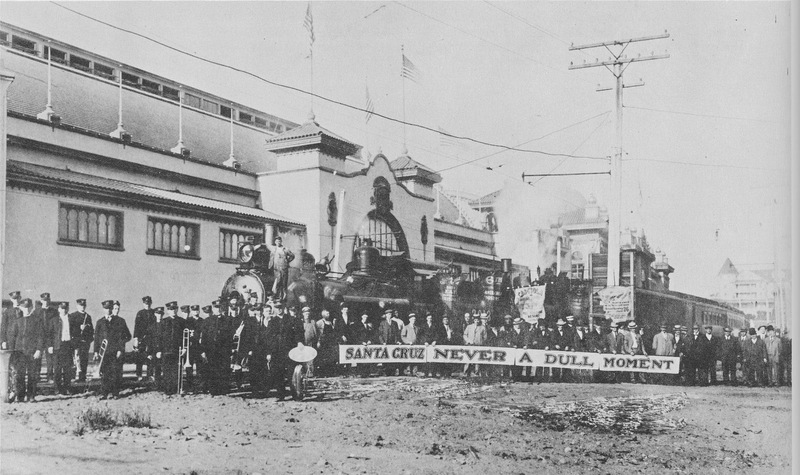 Working with the Southern Pacific, Santa Cruz was becoming a tourist destination, and people wanted to go to the beach. In 1904, the Neptune Casino was first opened alongside the Miller-Leibbrandt Plunge which had been remodeled to match the Moorish style of the casino. 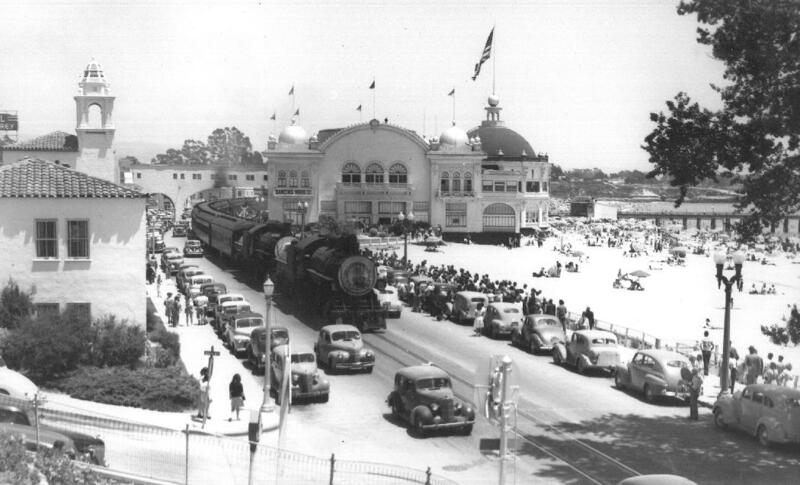 A bowling alley, roller rink, carousel, and pleasure pier were also built, establishing the first amusement park along the main beach. 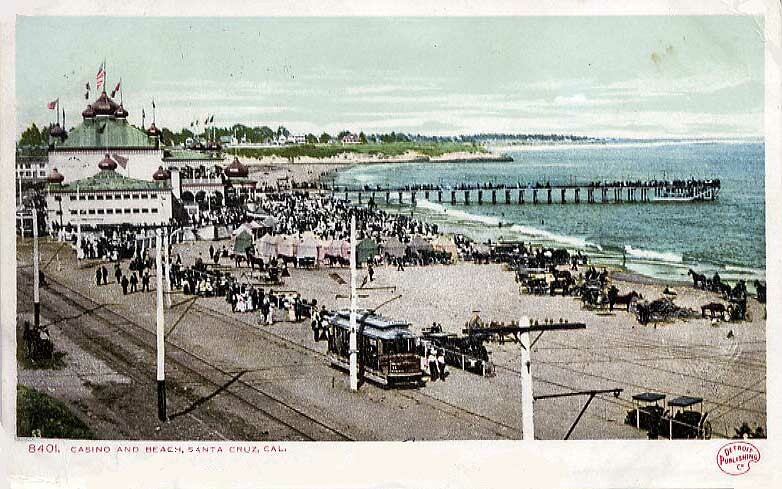 The Santa Cruz Beach Boardwalk today is a continuation of this park. The Main Beach in 1905 during the time of Neptune Casino (at left). 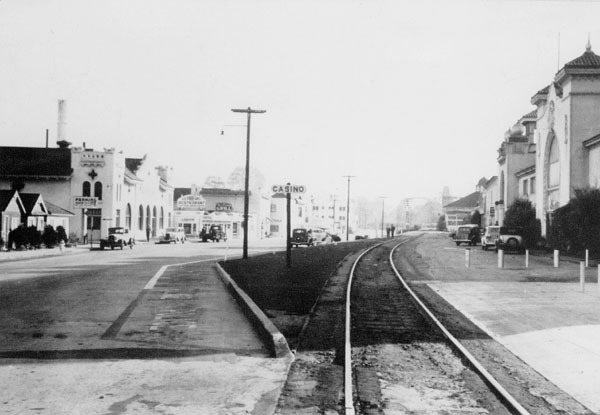 The South Pacific Coast line is not at left, with the streetcars using the right lane to take tourists to the beach from Santa Cruz Depot. The Neptune Casino thrived for two years, being expanded with further amusement areas and a sprawling tent city built where the current Boardwalk's parking lot is located. 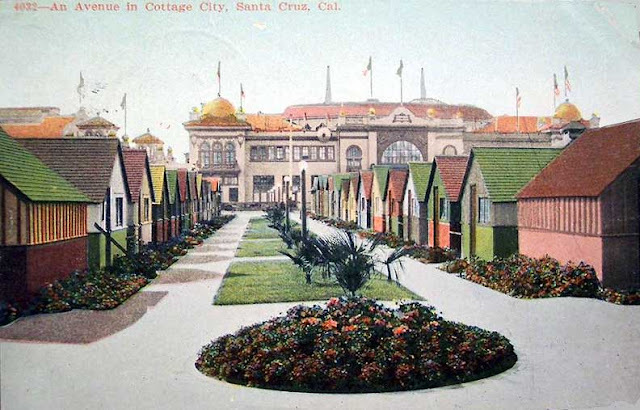 The Tent & Cottage City expanded during the year that the casino was being rebuilt. The Casino is shown completed in this image, dating the photograph to 1907. Swanton was bringing people and money to Santa Cruz, but tragedy struck on June 22, 1906, when the Neptune Casino, Plunge, and Tent City Restaurant all burned to the ground in one quick, all-encompassing fire. Swanton immediately began work on replacing the casino and the Southern Pacific trains kept coming. 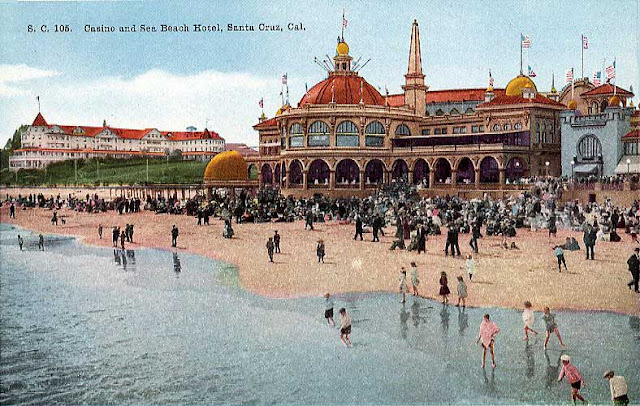 A large tent casino was built beside the site of the old casino and changing booths were installed along the beach. The Tent City underwent a renovation where half the tents were upgraded to wooden cottages. 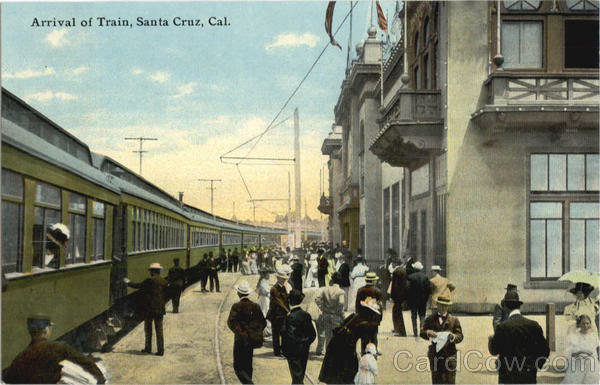 The trains kept coming, bringing tourists to Santa Cruz. The second Casino with the Sea Beach Hotel in the distance. The second and current Casino is the one best known for its relationship with the railroad. Dozens if not hundreds of romanticized photographs have been taken of Southern Pacific trains parked outside Entrance 1 of the Casino beside the Plunge Natatorium. Fred Swanton built the Casa del Rey Hotel beside his Cottage City, as well as the Casa del Rey Golf Course which earned its own flag-stop in 1911. 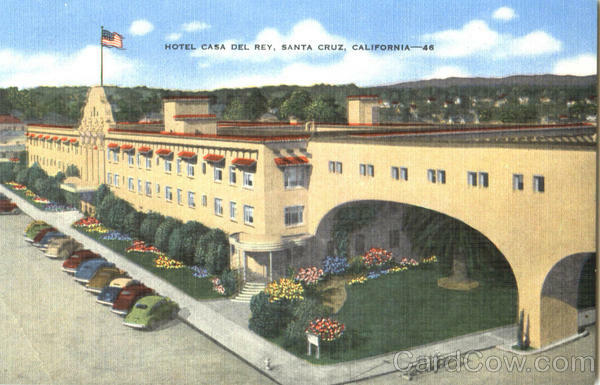 Casa del Rey Hotel in the 1920s with its arches that stretched to the Casino's grand ballroom upstairs. The train passed and parked under those arches in the thirty years that they existed. Swanton went bankrupt in 1912 and disappeared into the history books for a number of years. The Casino passed quietly to the Santa Cruz Seaside Company in 1915, which still owns the property today. Still, Swanton continued to promote Santa Cruz serving three times as mayor and bringing the Miss California Pageant to Santa Cruz in 1926. An early Suntan Special passing by the Casa del Rey Apartments (later La Bahia Motel) around 1928. 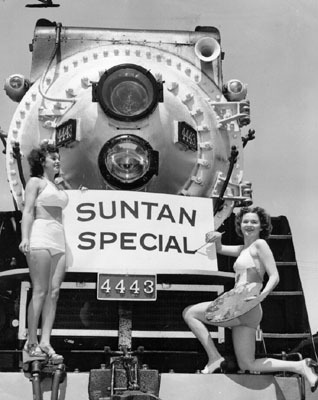 In 1927, the most famous of Santa Cruz's railroads came to town, the Suntan Special. When the Southern Pacific realized that they had a lot of unused commuter trains sitting in their yard on Sundays, they decided that promoting Santa Cruz was in their best interest. Two separate lines came over the mountain, one from San Francisco and a second from Oakland. Casino Station was their destination, though they stopped at other locations along the way and ended their tour at Santa Cruz Depot. When the Mountain Route was washed out and closed in 1939-1940, the route was diverted through Watsonville. Between 1941 and 1946, the special line was cut due to World War II, but it was resumed in early 1947 and continued until 1959. The route was finally stopped due to decreased sales and because the route was not considered necessary. The Boardwalk and Santa Cruz slowly faded from memory until the late 1980s would bring it back into popular culture. 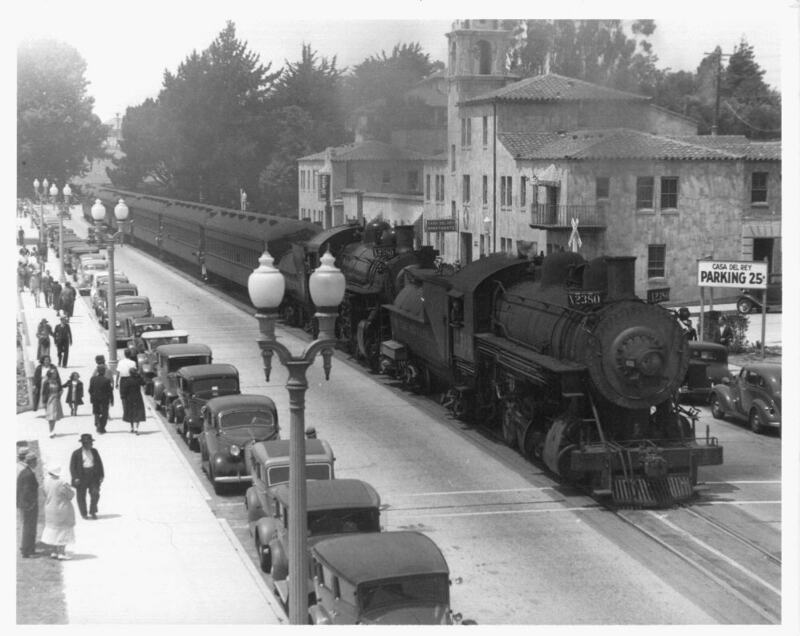 The train and its legacy in Santa Cruz would disappear forever. The first Suntan Special back in Santa Cruz after World War II, 1947. 1959 marked the end of the passenger train era in Santa Cruz. The Southern Pacific stopped bringing tourists to the county via railroad and no passenger service from outside of the county has resumed since that year. The intersection of Beach and Cliff Streets, the location of Casino Station. Casino Station changed little since it was, in reality, simply an unmarked but highly publicized flag-stop located at the intersection of Cliff and Beach Streets. There was little notation that the train stopped at the Casino, only popular knowledge and, probably, a sign and timetable. Passengers waiting to board the train outside Entrance 1 beside the Plunge Natatorium, circa 1908. There was never even a siding at the Casino. All trains shared a single track. With Santa Cruz Depot nearby, if a train required servicing or turning, it could go there. 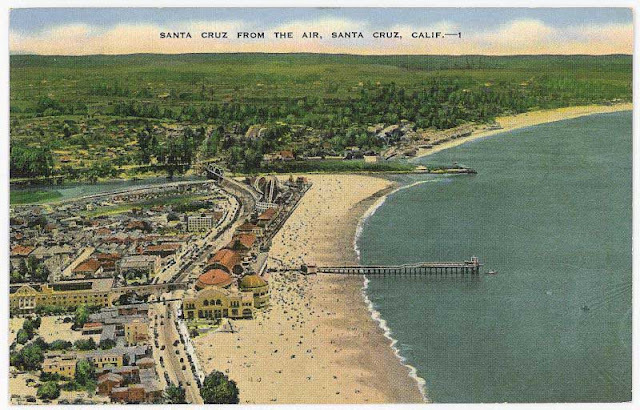 An aerial view of the Santa Cruz Main Beach from 1946. The Casino is the large building near the center with the tracks passing behind it at left under an arch of the Casa del Rey Hotel. reopened due to financing and bureaucracy. 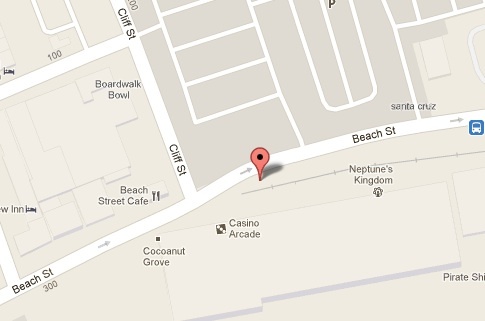 Today, the station's site still survives but goes unmarked. The Big Trees & Pacific Railroad, hosted by Roaring Camp Railroads, operates a passenger train service which departs from the Carousel, but it does not try to be in any way the Suntan Special. 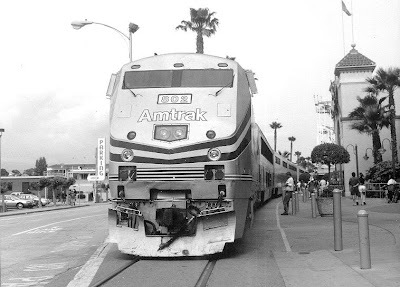 In 1996, two special anniversary Amtrak Suntan Specials returned to the Boardwalk as a momento to those who remembered the earlier days, but it was a one-shot attempt to reboot the passenger service and it did not succeed. The days of passenger service from San Francisco to the Boardwalk are long over and not likely to return anytime soon. Dunn, Geofrey. "The Boardwalk Empire." Good Times, 27 June 2012. Accessed 6 July 2012. <http://www.gtweekly.com/index.php/good-times-cover-stories/3960-the-boardwalk-empire.html>. Machado, Gay. Santa Cruz Beach Boardwalk: A Century by the Sea. Berkeley, CA: Ten Speed Press, 2007.